Expressionist Utopias: Paradise, Metropolis, Architectural Fantasy, Los Angeles County Museum of Art, 1993-1994, no. 112, pl. 93. 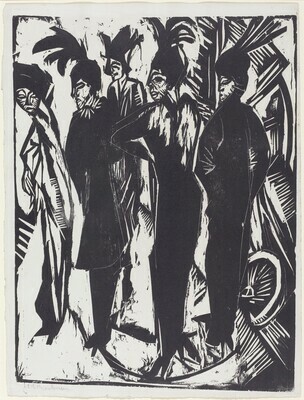 Ernst Ludwig Kirchner, 1880-1938, National Gallery of Art, Washington, D.C.; Royal Academy of Arts, London, 2003, no. 114, as Five Women on the Street. NGA Kainen Coll. 1985, 14, repro. p.44. National Gallery of Art, Washington. Washington, D.C., 1992: 324, repro. Ernst Ludwig Kirchner, 1880-1938. Exh. cat. National Gallery of Art, Washington, D.C.; Royal Academy of Arts, London, 2003: 43, no. 114.